MILAN -- AC Milan and its third-choice goalkeeper surprisingly edged city rival Inter Milan 1-0 after extra time to reach the semifinals of the Italian Cup on Wednesday. 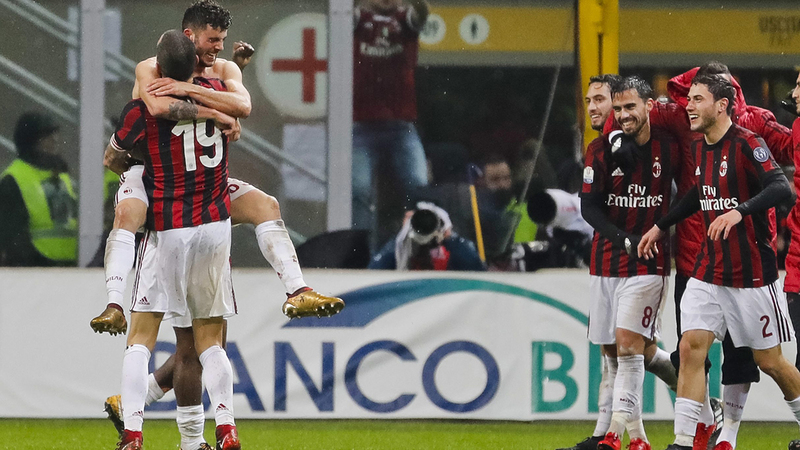 Patrick Cutrone scored in the 104th minute to book Milan a meeting with Lazio in a two-leg semifinal in January and February. The teenager was booked for taking his shirt off during wild celebrations. "It seems like just yesterday I was in the youth team, I was playing in a derby and I celebrated like this, but doing so at San Siro is something incredible," Cutrone said. "We needed this for morale, the derby is not a normal match. We'll enjoy going through and from tomorrow we'll think about our next league match against Fiorentina ... I love Milan and I want to stay here." This result is one of the few positives in a miserable season for Milan, which lies 11th in Serie A. Milan and Inter have lost their last two league matches but the Nerazzurri are third in the league. "There is still a lot of suffering ahead, it would be crazy to think we have solved all our problems with this win," Milan coach Gennaro Gattuso said. "But it will help us work more calmly." Milan was already without teenage goalkeeper Gianluigi Donnarumma and was hit by a late blow when second-choice Marco Storari pulled out of the warmup with injury. Antonio Donnarumma was given his debut. A former Milan youth team player, he was re-signed by the Rossoneri as part of the deal which saw his younger brother sign a new, long-term contract. Donnarumma appeared to have committed a howler midway through the half when Ivan Perisic knocked back a corner and the ball came off the goalkeeper and into his own net, but his blushes were spared when the goal was ruled out after video review confirmed Andrea Ranocchia was offside and standing practically on the line. That seemed to settle Donnarumma's nerves and the keeper acquitted himself well, with confident saves. He did brilliantly on the hour mark with a sensational reaction save to deny Joao Mario from point-blank range, although the Portugal international should have done better after being set up perfectly by Mauro Icardi. Both sides had good chances to seal the match in regulation time but it took until just before the halfway point in extra time for the deadlock to be broken. Suso chipped a ball over the top, and substitute Cutrone sidefooted it past Samir Handanovic from 10 yards. At the final whistle Donnarumma struggled to hold back tears of joy and he was hugged by all of his teammates as well as his younger brother.